(About) Believed to be Stephen Decatur Whitaker, Sr. and Elizabeth Taylor Whitaker. (About) "Final Surrender Memorial" at Franklin, Macon County, North Carolina. Colonel George W. Kirk, commanding Union 3rd North Carolina Mounted Infantry, and Captain Stephen Decatur Whitaker, Sr., commanding, Company E, 1st Battalion (Walker's Battalion), Thomas' Legion. 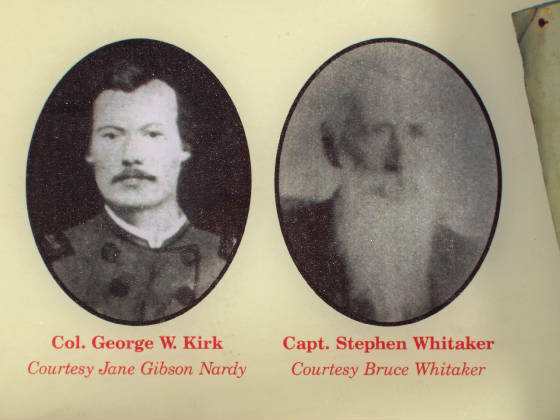 East of the Mississippi River, Whitaker formally surrendered the last Confederate soldiers to Colonel Kirk on May 12, 1865, at Franklin, North Carolina. While May 12 was the "The Final Surrender" for the Thomas Legion, the soldiers would be paroled a few days later on May 14. The First Battalion* Company E soldiers signed their parole papers beginning on May 12, with the last signature recorded on May 14, 1865. Col. William H. Thomas, commanding Thomas' Legion of Indians and Highlanders, had surrendered on May 9, 1865. Captain Whitaker and Company E, First Battalion of Thomas' Legion, were stationed at nearby Franklin, North Carolina. Whitaker and the company had recently Skirmished at Hanging Dog, Cherokee County, and were advancing toward White Sulphur Springs (present-day Waynesville) to reinforce Thomas when they were intercepted by the Federals. Union Gen. Tillson had ordered Col. George W. Kirk and the 3rd North Carolina (Federal) Mounted Infantry to Franklin (O.R., 1, Vol. 49, part II, p. 689), and when they approached the battalion, Whitaker rapidly formed a skirmish line. But upon receiving word of Thomas and Martin surrendering at Waynesville, on May 9, Whitaker and his company also surrendered. 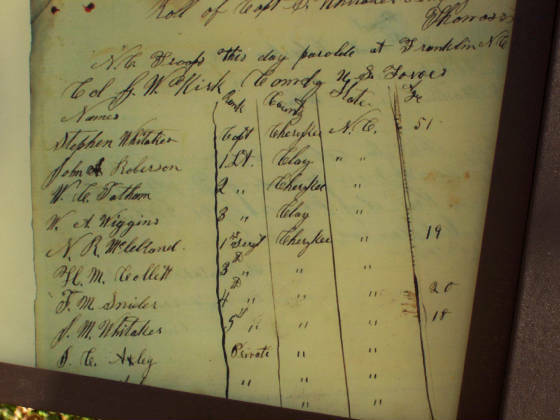 On May 14, 1865, the First Battalion soldiers of the Thomas Legion finished signing their paroles and they viewed Whitaker roll them up, tie them, place them in a Haversack, and give them to Col. Kirk's Courier. "And thus at 10 o'clock in the morning of May 14, 1865, our Civil War Soldier Life ended and our Every Day Working Life began," wrote John H. Stewart of the Thomas Legion. The Confederates had fought the good fight, and now the aftermath would embrace the region. *Lt. Col. James A. McKamy commanded First Battalion (aka Walker's Battalion) after the death of Lt. Col. Walker. But when McKamy was captured at 3rd Winchester, Lt James A. Robinson assumed command of the battalion. Robinson commanded the unit for the remainder of the Shenandoah Valley Campaigns (September 19, 1864 until its return to North Carolina with Special Order 267). Then, Lt. Col. William Stringfield commanded the battalion, with Captain Whitaker commanding it at war's end. Stephen's nephew, James Marion Whitaker, had also served with him in Company E.
Head Quarters 3rd Regt. N.C. Mtd. Infty. The bearer here of Stephen Whitaker Captain** Co. E 1st Batt. Thomas Legion C.S.A. having given his word of honor not to take up arms against the United States Government, nor give aid or assistance to its enemies until duly exchanged as a prisoner of war is paroled and has permission to go to his home and there remain unmolested. **Establishes the fact that when Stephen Whitaker was paroled he was recognized as a captain and not a major. However, William Stringfield, Robert A. Akin, and others referred to him as MAJOR Stephen Whitaker. Captain or Major? Captain was the assigned rank for company commander, and major or lieutenant colonel was the assigned rank for a battalion commander. The disparity in Whitaker's rank may be due to the fact that for a portion of the war, Whitaker commanded the entire First Battalion, Thomas' Legion. Again, typically, a major or lieutenant colonel commanded a "battalion" and therefore, unofficially and respectfully, many referred to Stephen Whitaker as MAJOR. It is also the writer's view that Stephen Whitaker should have been officially promoted to at least major due to rank and responsibility. Additionally, at war's end, Captain (commonly referred to as Major) Stephen Whitaker commanded First Battalion of Thomas' Legion. I have not located any official document showing Stephen Whitaker's rank above Captain. During the last months of the American Civil War, when the "Lost Cause" was embraced, many soldiers were unofficially promoted by their peers to fill vacancies. This may also explain why the officially mustered out rank/grade was often times a lesser rank than claimed via soldiers' diaries, memoirs and papers. During the last months of hostilities, there were privates being unofficially appointed to the rank or grade of lieutenant. Concurrently, some Confederate commanders were destroying all, or what remained, of the regimental records. Captain Stephen Whitaker, Company E, Walker’s Battalion, Thomas' Legion: letter to his parents in Cherokee County, North Carolina. After a bisey day at the sity I write you a few lines. I left my company at Cold Creek last Friday all well except some slight sickness not worth note. I have bin to col. Thomas head quarters his legion is now under Gen. A. E. Jackson [General Alfred Eugene "Old Mudwall" Jackson] and our boundary appears to be Western N. C. and Eastern Tenn. I am to remain at cold creek a while yet to search [for] deserters & to prevent catel from being driven from the state. I was at the S[trawberry] Planes [Tennessee] 2 days but did not get to see David*** [2nd Lt. David L. Whitaker and is Stephen's son] as he was out on a scout. I bought today 3 tombstones 2 for my litel children & 1 for mother. It is nearly five ft long & 10 inches wide. He is to put on it all the leters you sent & finish if off for $50 and is to furnish a footstone & deliver it at the deport of this sity. My 2 costs 24 dollars for a very small size. I understand Brother Silas Raised a company in Gilmore County [Tennessee] yet it is gon to severville [Sevierville, Tennessee] and I do not know the truth of it. I suppose it is so. Father I may not git home again till the war is over & probly never. I want you to try and go to my house & git the date of birth of my litel childrens and the death & send it to me at cold creek so that I have the tombstone leters made. I hope that you or someone else will see that them and mothers is put in there proper place. It is the uncertainty of life that prompts me to ask this of you tho I hope to see it don myself. There is no war news of intrest except that Rus and Vance [referring to Brigadier General Robert B. Vance, brother to North Carolina Governor Zebulon B. Vance] are falling back [illegible] burrow. Father write to me soon as I want to hear from you and my friends. I would like to say that I have 120 men in my company. I have no trouble with them yet. My orders has never bin disobeyed and has not disobeyed one single one yet. I am tired and it is about nine oclock. ***2nd Lieutenant David L. Whitaker served in 2nd Company A or 2ndA, Thomas' Legion of Cherokee Indians and Highlanders. Second Company A was organized on April 9, 1862, and was Thomas' first Indian Company (by the end of the war there were 4 Cherokee companies that comprised the Cherokee Battalion) and mustered at Quallatown, North Carolina. William H. Thomas was promoted to major in July 1862, and James W. Terrell was promoted to captain on July 19, 1862, and upon promotion to captain, Terrell assumed command. (N.C. Regiments III, 732, Pay Voucher, October 18, 1862, James Terrell's Service File.) On September 27, 1862, when the regiment mustered it became Company C, and William Love was elected as captain (North Carolina Regiments III, 730; Pay Voucher.) When Captain Andrew W. Bryson's Company (First Company A or 1stA) was transferred to the 39th North Carolina Regiment, Thomas shifted his companies and this Indian Company again became Company A. (Numerous Bryson's served in Thomas' Legion). Stephen's 2 children who had died and for whom he bought tombstones were probably Harriet & Jefferson Davis, b. 1860 and 1862. The David mentioned in the letter may have been Stephen's son and oldest child, David Lafayette Whitaker, b. 31 Jan 1838, Macon Co, NC, died 8 Apr 1912, Valley Town Cemetery, Andrews, Cherokee Co, NC. Stephen Whitaker, b. 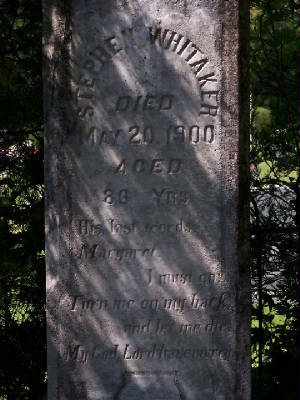 9 Feb 1814, d. 20 May 1900, buried Valley Town Cemetery, Andrews, Cherokee Co, NC, was the son of James & Mary "Polly" Walker Whitaker. Notice in his letter, it is addressed to Father and Mother but he mentions buying a tombstone for mother. I have that Mary "Polly" Walker Whitaker died 13 Aug 1849 and James remarried Mary McBrayer on 15 May 1853, so I'm assuming the letter was actually addressed to his Father and stepmother. Source: Stephen Whitaker Papers (36) Private Manuscripts Collection, North Carolina Division of Archives and History. I write you a few lines. I am well but some what tired. I just got back from Jones borrow at 3 oclock last night. I did not sleep any for 2 nights. My self and my company is giting along very well except some 3 or 4 sick. I got a leter from home to day which informed me that the family was sick with the measles. I can not git to go home now but I think I will before long. I was sorry to here that you was ailing and I hope you will soon git beter. Father the service is hard on me but I stand it as well as any of my men and had harder days before me. We are still under Gen. Jackson & I think we will be ordered back to the railroad. The news this morning is that the yankeys have taken Jackson Missisipi but it is thought to be a union lie. We gained a grate victory at Fredersburg [Battles of Chancellorsville and Fredericksburg] v.a. and we take it that we got 40000 stands of arms & routed them back across the river. Father I herd from David yesterday. He is giting well fast as can go about and will soon be able to ride. Manual Setson is here an will go on in a few days. We are soon looking for Eli Ingram badly [Lt. Eli Ingram, Company H, Infantry Regiment, Thomas' Legion. Formerly this company was assigned to Company F, Infantry Regiment, Thomas' Legion]. I had two men deserted the other day. They were caught and will be tride by a Gen. Court Martial. This policy will be adopted here afterall men absent without Leave that is arrested & do not come in on there own will be tride. Without a lasting peace I do not want to return home, and nor would I want to do so while I am abel to do duty. The yankeys cant whip us nor starve us out. Wheat crops is beter than usual & thar is a very large crop of corn planted. It looks promising We under stand that Gen. Prise [Confederate General Sterling Price] has got an army in Missouri of 60000 men & provisions plenty. Father I have not time to write more now. If you here from Joshuas boys please let me know and if some of them has been killed at Fredersburg. Let me know how you and mother is giting along. I sent you some things by Mark which I hope you have got. I know all you want to write soon. I have not had a leter from you sence I left cold creek. Source: Stephen Whitaker Papers (26) Private Manuscripts Collection, North Carolina Division of Archives and History. I wrote you a few lines to let you know whar I am and what I am doing. I am very unwell at this time and have had a saver cold and it has turned to some thing like the Plauzy. I suffer very much to still on my feet. If I do not git any beter I am next to git to a house. Martial [Private George W. Marshall, from Clay County, N.C.] is very sick tho not dangerous. Wetherman & Graham [Privates Henry H. Weatherman and Levi S. Graham are from Cherokee County, both served in Whitaker's Company, Walker's Battalion, Thomas' Legion] is both on the mend. Walkers Batt is here. We are garden the Bridge over Wattoger & keeping our pickets. The bushwhackers came in 4 miles of her a few nights ago to a Mr. Johnston & cawled out his sons both lieut in the army & told them that the yankeys had taken carter depot & was coming on them for them to make ther escape. By this they got up and went out and was taken off by the cowardly reches & one of them was shot and the other one is probably murdered. The one that was found was buryed by my men yesterday. They was both fine young men one in the recruiting service, the other at home on furlow. That has bin a force sent to NC to put down the bushwhackers thar. Father I wrote you from Knoxville a few days ago in relation to the tombstones. I thout then I might be sent to Charleston or back to Loudon. If I had I could have seen to giting the stones hauled up. They are shipt to Cleveland. You can some one that is goin after salt to haul them. Doct. Washham will have salt thar in the space of a week. If you cant do this you can git 2 of my men & send after them. David got her safe. He slept with me Friday night. His company is in Yancey Co NC. He is goin to report to gen jackson [Gen. Alfred Jackson] & report for orders for he cant git through the mountains to his company now for the bushwhackers. The vixsburg Prisoners [referring to the paroled Confederates at the Battle of Vicksburg] is giting home daly. They had a hard time. They do not blame Pemberton [Confederate General John C. Pemberton] for the surrender & say that Gen Johnston [Confederate General Joseph E. Johnston] did all he could to releave him but was not able to do so. We lost 27000 Prisoners in the worst lick of the war, but we still have about 40000 yankey Prisoners after exchanging in for the vixsburg men. I got this information from an officer in the exchange department & now her with me. Father I have paid Hays a det I have long owed him. Col. Thomas [Colonel William Holland Thomas, Commander of Thomas’ Legion] is at Knoxville under orders. I do not know all the charges against him. The principal one is for disobedience of orders. Thomas will be smart enough for them. Thar is grate pregatis against him. Col. Walker [William C. Walker, Commander of Walker’s Battalion, Thomas’ Legion] is her. I beleave I have the good will of all the officers from Gen Jackson down. My own men is all very good to me. They will do anything for me. I have not an inimey that I know of in the company, but not so in Cherokee County as I have bin lide about very much. All will come rite & the rite will be sustained. The young man that was supposed to be murdered has bin recovered by a Union man & brought home to stay. This must be grate satisfaction to his father who thought he was killed. Father you will git tired of reading this long letter. Green Woods boy had a leter come to camp the first chance. He can come by Rocky Point & to Knoxville or Strawberry Planes & then on the railroad to this place. Father write to me and give me all the news. Direct your leters to Carters Depot Tenn Walkers Batt. Father give my respects to the friends & reserve affection for your self. I take this time to write you a few lines. I have writen you often since I left home but I doubt whether you have received them. The mail is so uncertain. I am well as usual & so is the company. We left Carters Depot on the 7th inst to meet a yankey Raid on this place. We got her on the 8th and lay in line of battle for 3 days. The yankeys turned ther force around attacted Dublin. Our forces met them thar. They had a suver fight. The yankeys drove our forces back& burnt the Depot & the Bridge over the Little River & done some damage to the railroad & telegraph wire but they was afterward driven off. We lost some 250 men killed, wounded & prisoners. The yankeys lost more in killed and more in Prisoners 120 of them is her now. They had 10,000 men. We did not have one third as many. We her that Gen. Brecanrige has captured that trane of wagons and part of the men. The news from Richmond is the best kind tho you will her well about it before this reaches you. The news from the west is also good. If half we her is correct the war will soon be at an end. We also her that Gen Johnson has whipped Thomas at Chattanooga and that both armeys has gon to Richmond. It seems that it is the intention of both forces to decide the contest thar. Father we are all confident of gaining our independence before long as we hope this summer will wind up the war. Father we are at this time cut off from all the world except part of Tenn. The railroad is cut east of her. We cant her from home. We thought when Charlie Truit got back we could her from our friends but he, it seames, is not coming back this time. His time has bin out for a month & now he cant git her if he wanted to. Saltville [American Civil War: Virginia Saltworks Campaign] is 9 miles from the R.R. with a branch R.R. leading to it. You have no idea how much salt could made her tho the workers is nerly all idel now. Thar is a large store of salt her if I could git it home I could git as much as I please but thar is no chance of giting in shipt away. The Northern works is idel & so it the govt works. It is uncertain how long we will sty her. We will very likely go to Richmond or we may go back to Tenn. I heard yesterday that Gen. Forrests cavalery was at Cleveland Tenn. If it is so, one could go thar & see whether the tombstones is thar or not. I fear they are lost or split. I would rather than five time the cost they would have bin got home and put up, but it cant be helpt now. I have nothing else of intrist to write. Lieut Ingram is well. Green woods is well & makes a good soldier. Tell litel Jim we would like to see him her if he was well enough. Tell him we whipt the yankes at Carter the worst kind. The boys done ther duty as usual. We only had 3 wounded, one since dide. The yankes lost near fifty killed & wounded. This is the last time they have ventured so far fro Knoxville. A Tennessean by the name of Rown will take this leter to N.C. whar he will mail it or he may take it to you. You can send it to my wife as I have not time to write more to night & he is going to start soon in the morning. This will give her the news. If you write direct to Saltville Va be sure to name the Battalion, Legion & Briggade. If you do this leter will follo us wharever we go. James and Polly Whitaker had 13 children: 1. Sarah (1801-38). Born in Fairview. Married Benjamin Mann. Died in McDowell County, North Carolina. 2. William (born 1803 in Fairview). 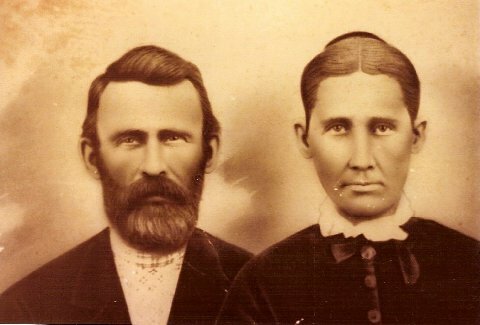 Married Anna Ervin in Macon County, North Carolina, and moved to Georgia. 3. James, Jr. (1804-99). Born in Fairview. Married Nancy Kyle. Died in Andrews. 4. Elizabeth (1806-52). Born in Fairview. Married Spencer Shearer. In 1843, they moved to Cypress, Titus (now Franklin County), Texas. She died there of pneumonia. 5. Jesse (1808-91). Born in Swannanoa. Married Caroline Ervin. They moved to Georgia. He died in Whitfield County, Georgia. 6. Joshua (1809-86). Born in Swannanoa. Married Lydia Burgin. They moved to Edneyville in Henderson County, North Carolina, where he died. 7. 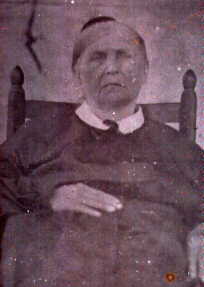 Mary "Polly" (1812-1902). Born in Swannanoa. Married Samuel Jarvis. They moved to Cherokee County, Georgia. Died in Georgia. 8. Stephen (1814-1900). Born in Swannanoa. Married Elizabeth Taylor. They lived in Andrews. Stephen, a major in the Confederate Army, led [perhaps] the last battle of the Civil War, the "Skirmish at Hanging Dog." He died in Andrews. 9. Lettice (born 1816 in Swannanoa). Married Garret Taylor. 10. John (born 1818 in Swannanoa). The first Postmaster of what is now Andrews. Moved to Arkansas, and later Oklahoma. Worked for years on Mississippi River boats. 11. Silas (1820-1916). Born in Swannanoa. Married Rebecca Allison. They lived in Cherrylog in Gilmer County, Georgia. 12. Adeline (1822-1907). Born in Swannanoa. Married Robert Paul Dunkin. They moved to Loudon County, Tennessee, where she died. 13. Carolina (Born 1825 in Swannanoa). Married John Kimsey. The Battle (or Skirmish) of Hanging Dog should not be confused with the fight known as "The Last Shot". It is the writer's view that the Skirmish of Hanging Dog and The Last Shot transpired simultaneously. During one skirmish with Goldman Bryson's Company in October 1863, Captain Whitaker's brother-in-law, Lt. C. H. Taylor, was personally "recommended" to General Braxton Bragg.